Picture - The Death of the Earl of Warwick. The Earl, of the Duke of York's party, lays dying in the grass - 1623. 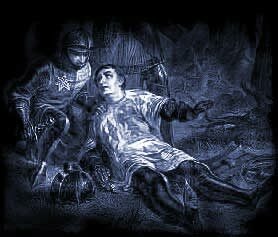 Richard, Duke of York, takes the throne of England but when confronted by King Henry VI he agrees that he will not take the crown and will leave Henry in peace if his own family are named as the rightful heirs to the throne. Queen Margaret is furious as her weak husband King Henry VI has thus disinherited their own son, Edward, Prince of Wales. The sons of York berate their father for not taking the throne for himself. York goes back on his agreement with King Henry and once again attempts to seize the crown and become King. Margaret raises an army and fights a battle with York at Wakefield. York is taken prisoner his son, Edmund, is killed. Margaret taunts York who is eventually stabbed and killed by Margaret and Lord Clifford - the head of the Duke of York is placed on the gates of York. The fighting continues and the Earl of Warwick is defeated by the Queen. Warwick informs York's sons, Edward and Richard, of the defeat and the Queen's plans to march on London and reclaim the throne for Henry. Warwick believes that they, the Yorkists, can still win and Edward, who has now become Duke of York following his father's death, can then claim the crown. The armies meet and the timid and weak King just watches the battle. The Yorkists win the battle and the Queen flees to France with her son and Clifford is beheaded. The weak King Henry is captured in the north of England and imprisoned in the Tower of London. Edward, Duke of York, is proclaimed Edward IV. Warwick insists that the new monarch should forge ties and allies with France and marry Lady Bona, the sister of the King of France. Warwick goes to France to make the arrangements. Edward is king, his brother Richard becomes Duke of Gloucester and George, another brother, becomes Duke of Clarence. Edward falls in love and marries Elizabeth Woodville, Widow of Sir Richard Grey and therefore referred to as Lady Grey, and she becomes Queen. Warwick is so incensed by this action that he changes sides and tells Margaret that he wishes to help place Henry back on the throne. At the same time the hunchback, Richard, Duke of Gloucester, is plotting to overthrow his brother Edward and claim the crown. The French King Louis decides to support Warwick and Margaret providing they pledge their loyalty to him. Warwick then offers his oldest daughter to Margaret's son, Prince Edward and when the prince accepts the proposal, Louis appoints his high admiral, Lord Bourbon, to ferry troops to England. Back in England many of King Edward's followers are also unhappy with his marriage. Edward's own brother, the Duke of Clarence joins Warwick and agrees to marry the youngest daughter of Warwick. Richard, Duke of Gloucester, stands by his brother , but only because he hopes to take the crown for himself. Warwick' s forces enter England and they capture the monarch and free Henry from the Tower of London and reinstall him as king. However, the meek man has had enough of Kingship and he asks Warwick and Clarence to rule jointly in his stead so that he may pursue a quiet life of prayer. It is believed that the script was first printed in 1594 although this is not substantiated. As William Shakespeare clearly did not want his work published details of the play would have therefore been noted, and often pirated without his consent, following a performance. The settings are England and France. The number of words in the script, according to the Complete Public Domain Text is 26,195. King Henry VI, Queen Margaret and members of the Yorkist and Lancastrian factions. The following quote from the drama is amongst Shakespeare's most famous 'Having nothing, nothing can he lose'. Details of this famous quote follows, complete with information regarding the Act and the Scene, allowing a quick reference to the section of the play that this quotation can be found in. Please click here for the full text of the script of the play. "Having nothing, nothing can he lose". (Act III, Scene III). Click the link at the top of the page to access a list of all the cast and characters of King Henry VI.